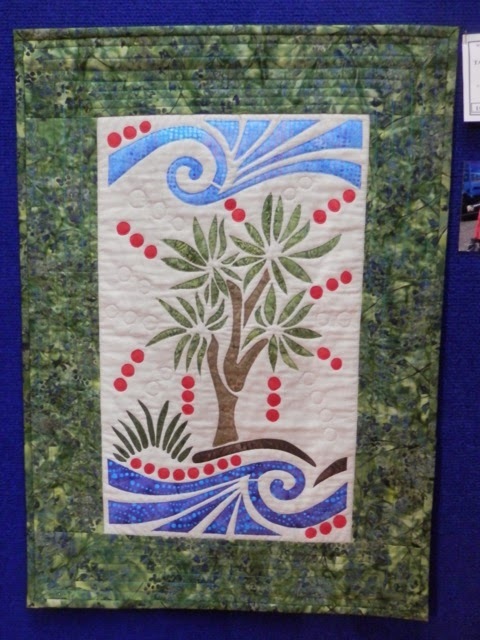 In my last blog post I said I'd give you the pictures from the Whangarei Quilt Exhibition later. Well, here they are. Picture heavy post! 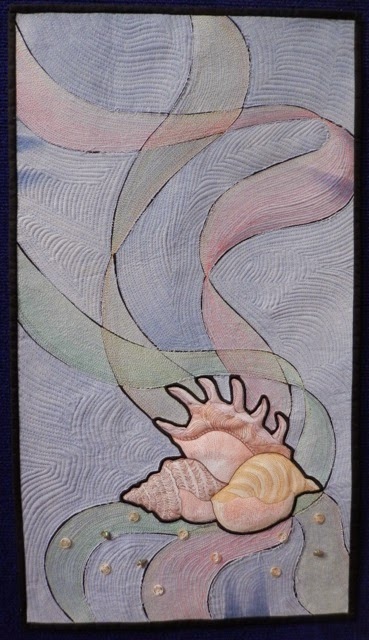 This quilt Wind in Their Whiskers by Dawn Dahlberg won Viewers Choice - Club Vote. 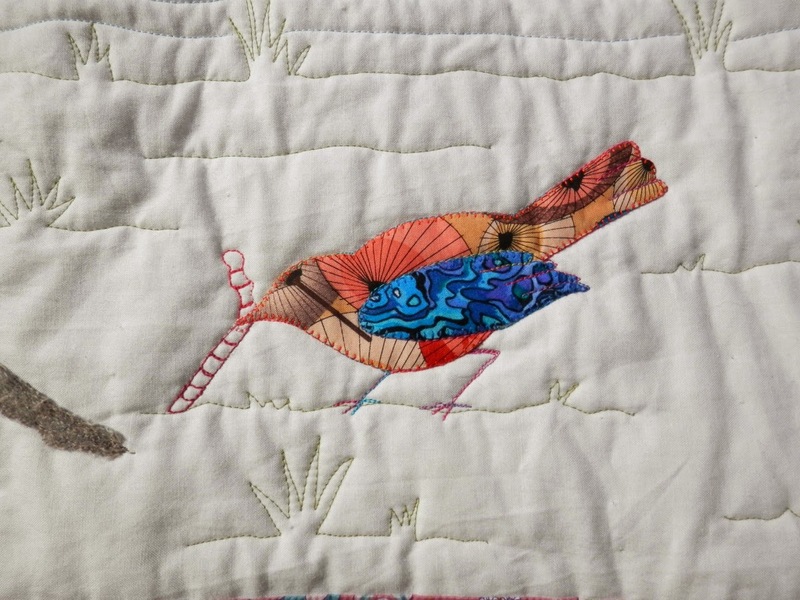 It's a pattern by McKenna Ryan and Dawn has very skilfully completed the appliqué. You can see a close up of the 3D elements hanging on the clothesline in the photograph below. 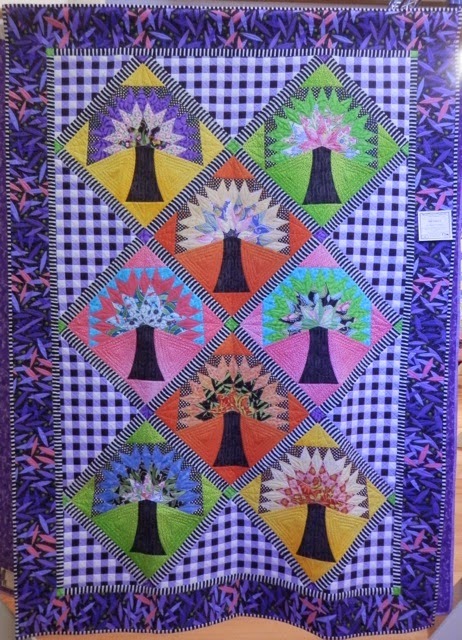 This quilt caught my eye. A good use of striped, spotted and checked fabric. 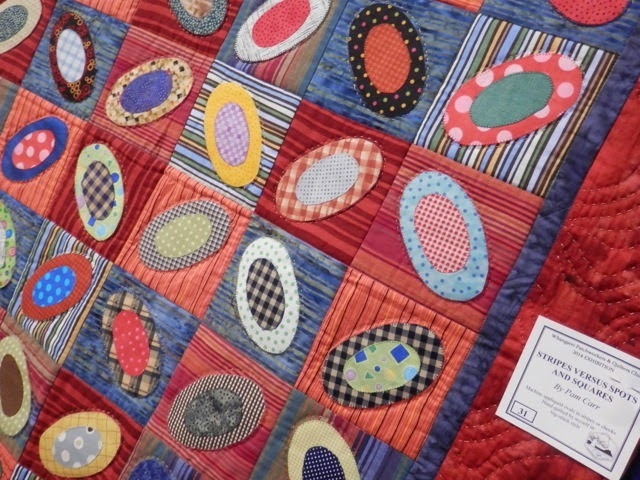 It's named Stripes Versus Spots and Squares, and it was made and hand quilted by Pam Carr. 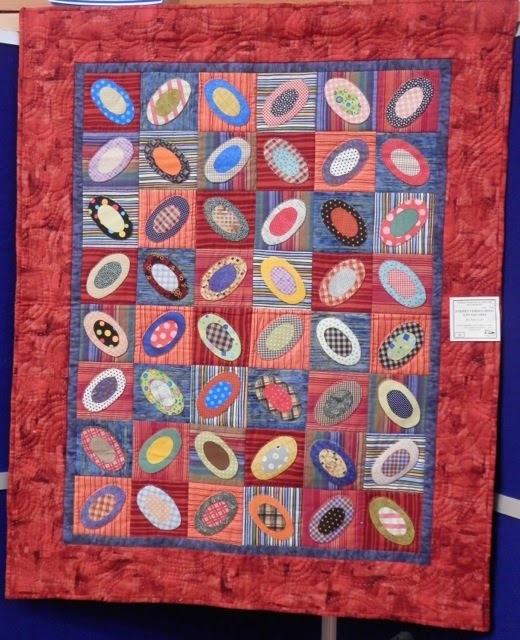 This quilt by Rikki Going won Best Use Of Colour. Titled Succulent Southwest, it represents Rikki's memories of New Mexico. 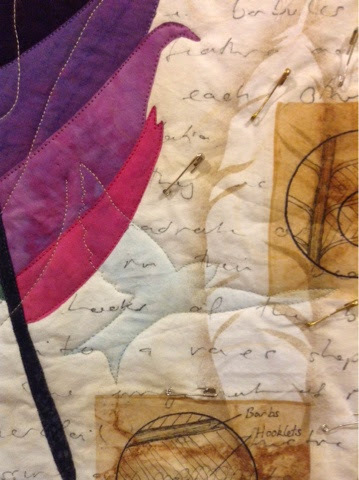 Cynthia Johnson used her hand dyed fabric and surface design to make this quilt called Moon Phases. 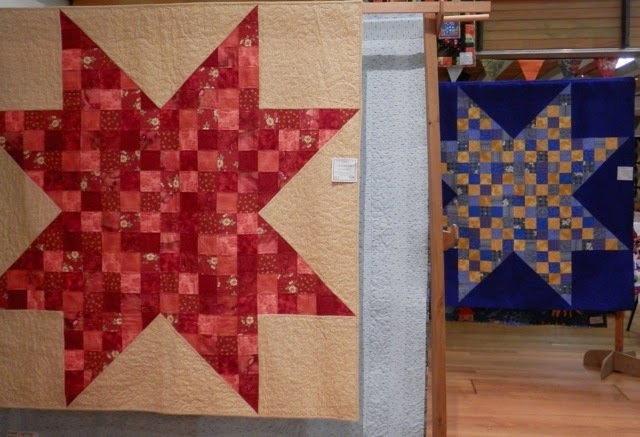 I loved the way these two quilts, both made by Leeann of Quilt Whangarei, were hung. They really led your eye, but didn't compete by being side by side. Leeann's favourite is is the red one. 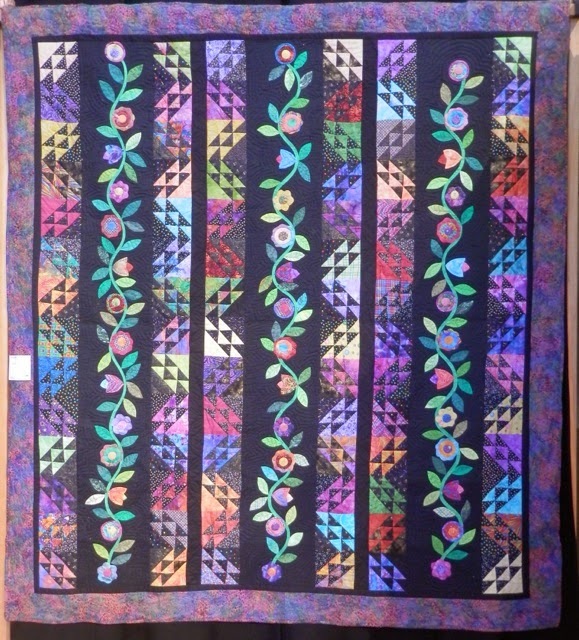 This quilt called Lattice, was made by Kim Bodman from a pattern she found in Australian Quilters Companion. 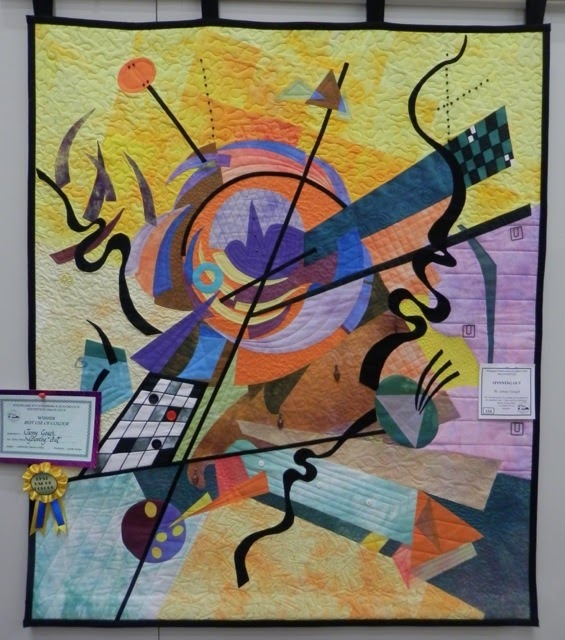 It won the Novice Quilter award. The graphic elements of this little wall hanging caught my eye. It was inspired by a decorated rubbish bin! 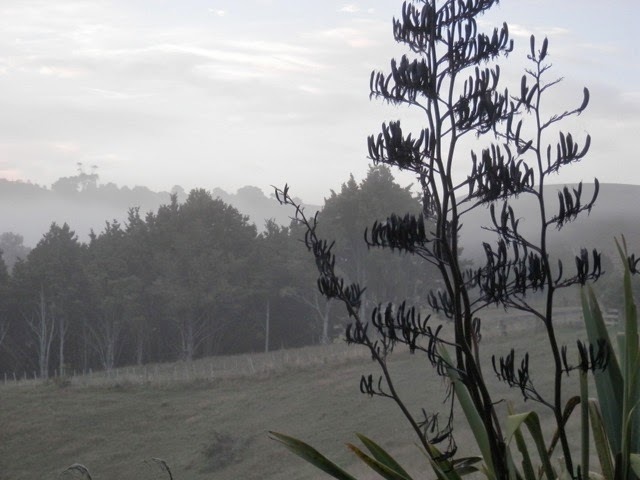 It's called Taupo Cabbage Tree and is by Jane Robinson. Spinning Out by Jenny Gough was inspired by a print of a painting (artist unknown) and won Best Use of Colour. 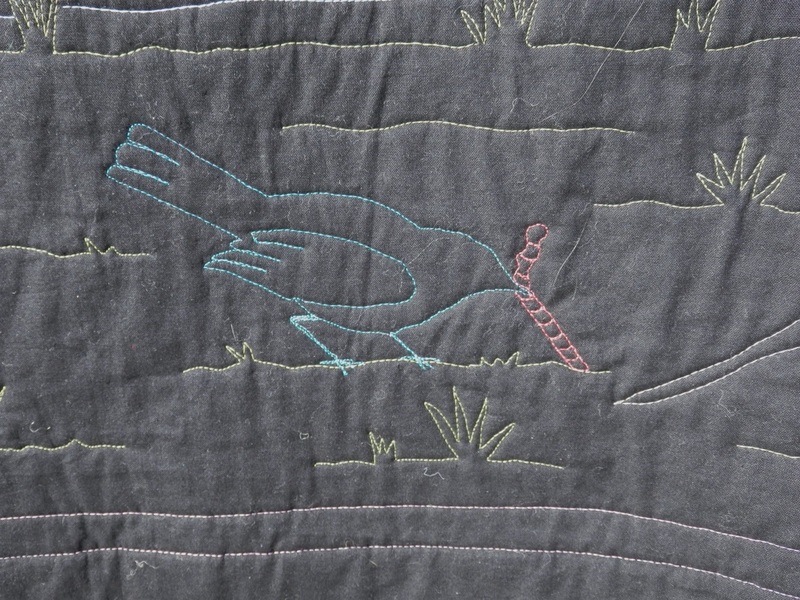 I had to take a picture of this one as I'm told it features some of my hand- dyed silk/cotton embroidery threads! 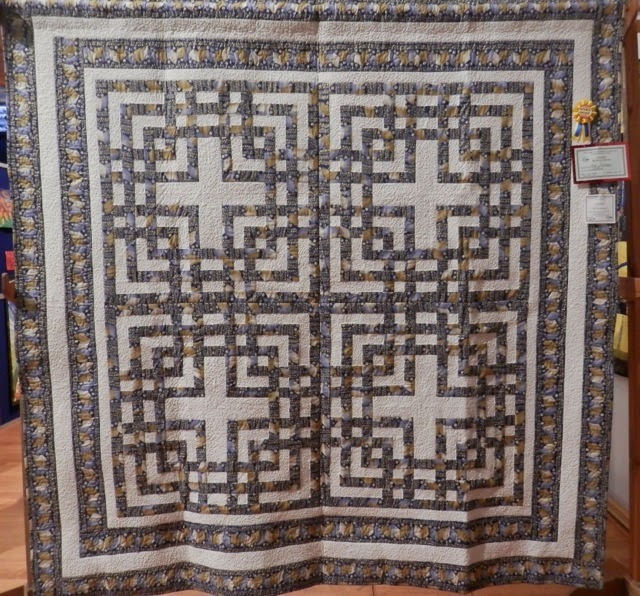 It's called The Runner by Shirley Julian and was made using a technique she learned from Dena Crain at the Taupo Symposium. 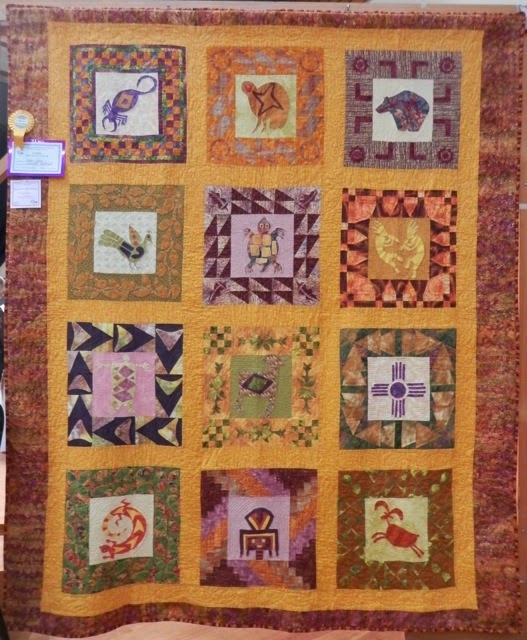 There were several quilts like the one above, all made in the same class run by Petra Pilkington. This one is by Jenny Gough. I liked seeing mixed media being shown. 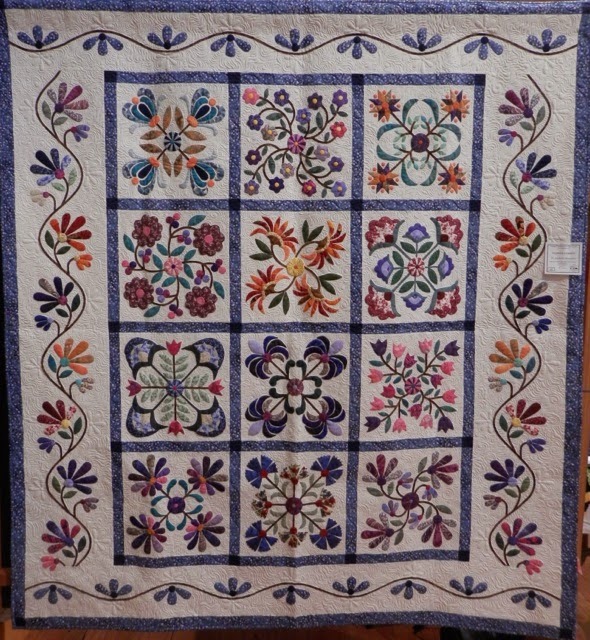 This intensely coloured and interesting quilt was another that caught my eye. 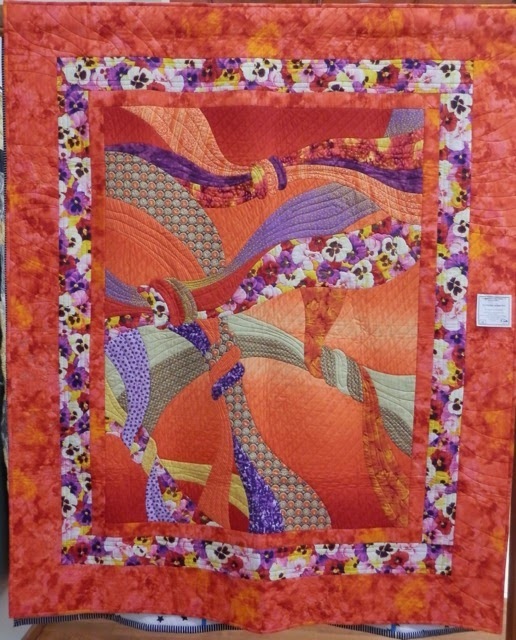 It's called Flowing Ribbons, made by Ngaire Fleming in a class by Sally Smith. 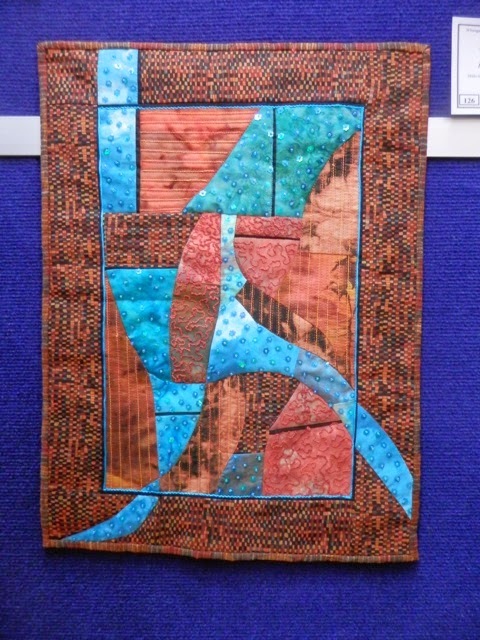 Quilted by Leonie Wihongi. 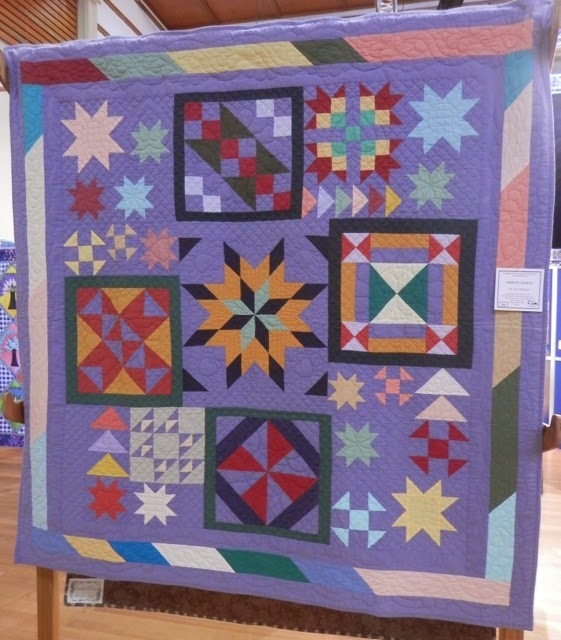 The use of only solids gave this quilt a point of difference. Made by Lyn Madden, it's called Friend Choice. This is another by Ngaire Fleming and was started in a class by Sarah Fielke. 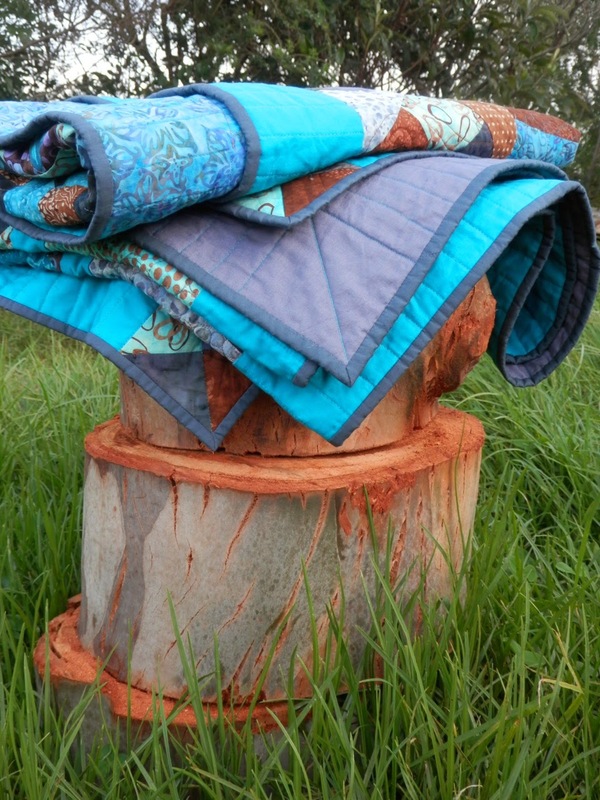 The quilt is called The Grove and was quilted by Leonie Wihongi. 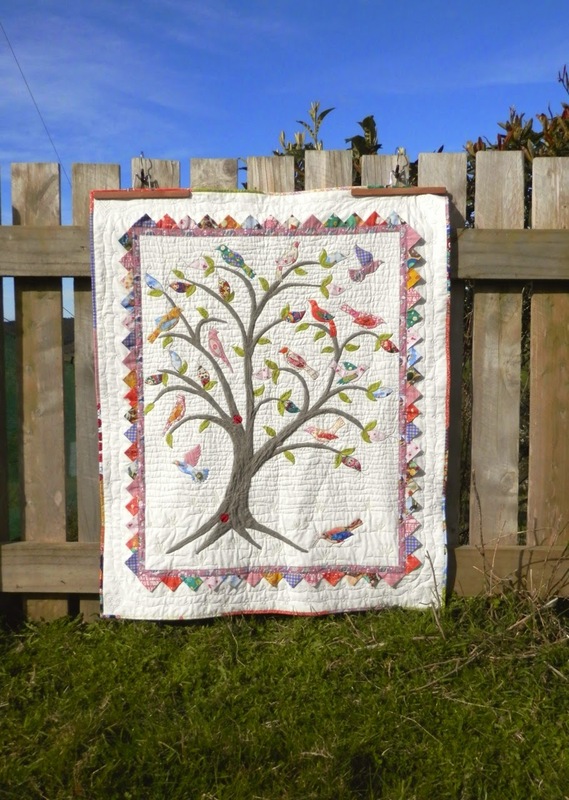 I've become increasingly attracted to old style, really traditional quilts. And isn't this a beauty? Scrappy Irish Chain by Lynne Wilson. The colours are a bit funky on this photo because of the lighting, sorry. Midnight Blooms by Jean Nutter. Needleturn appliqué always impresses me! And Jean Nutter is obviously a handwork enthusiast. 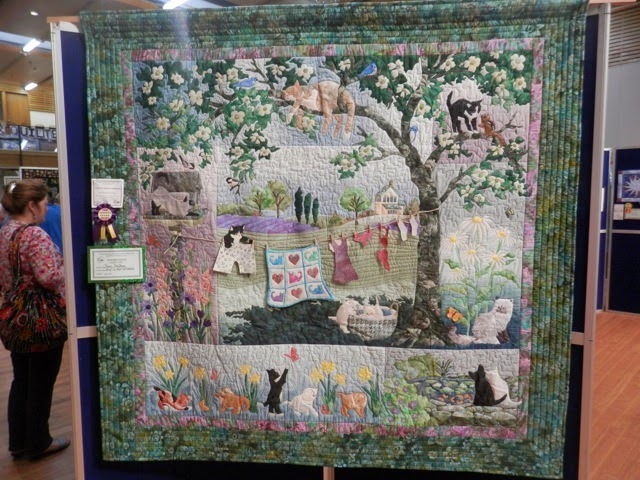 This is called Rambling Roses and is a copy of a quilt called Little Brown Bird by Margaret Doherty. 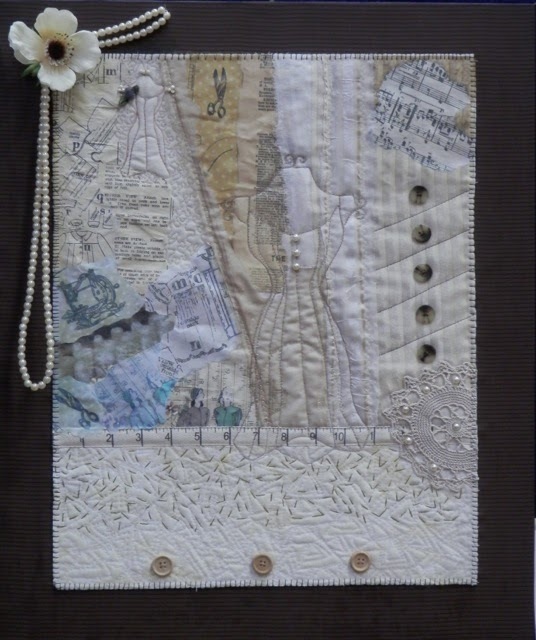 Machine quilted by Jo Hollings. 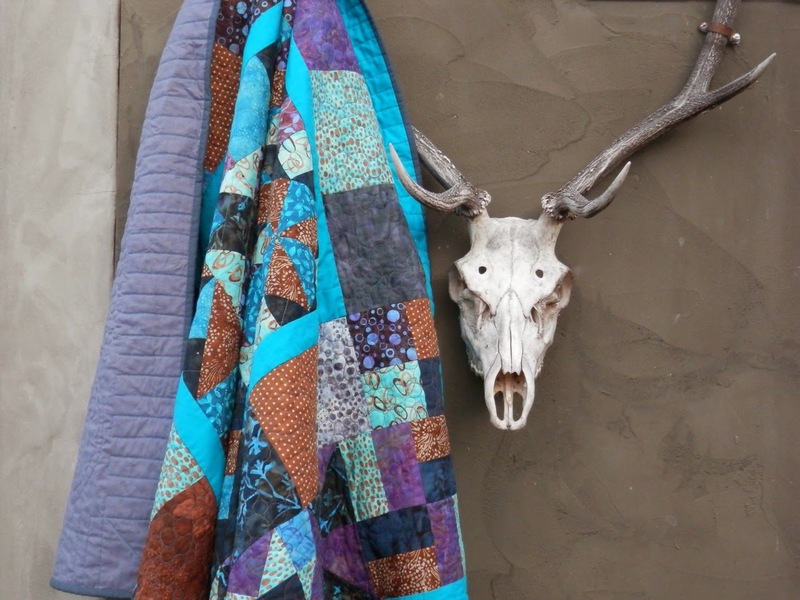 Here's two quilts from the shirt challenge. 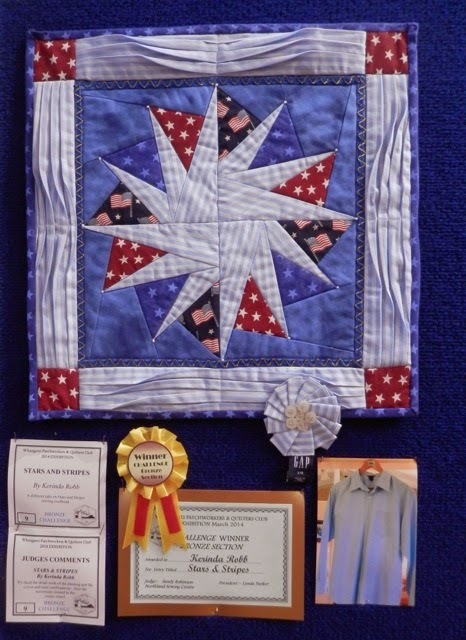 The first is called Stars and Stripes by Kerinda Robb and won the Bronze Section. The second is called Chambrayed and is by Lynne O'Donnell. And the last picture I took is of my viewer's choice vote. I admired the fine work in this one and it's something that I probably will never do, so I admire it all the more. 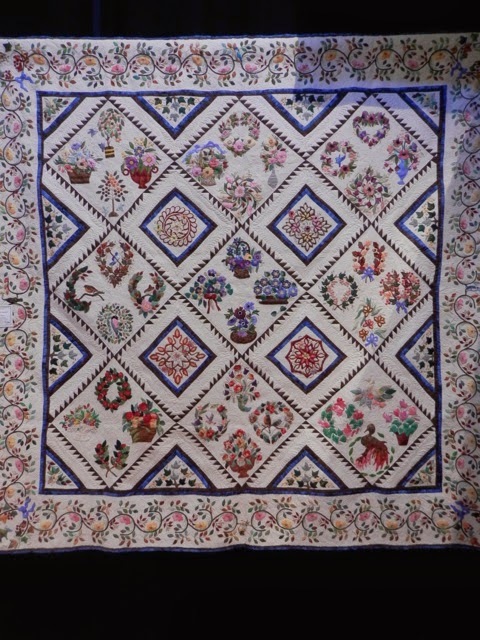 It's called Flower Garden and is made by Jeannette Monaghan and quilted by John Neilsen. 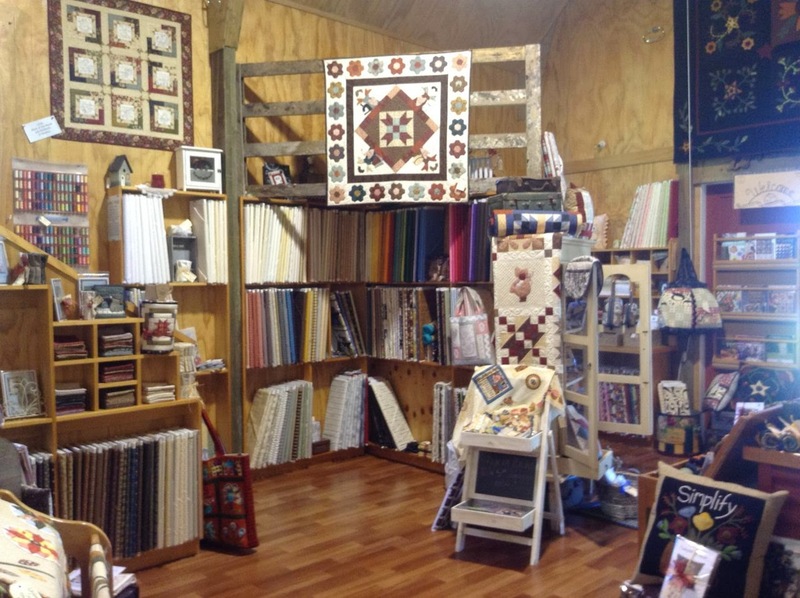 A Quilty Finish: Immersion. And Show Notes from Podcast Episode 5. 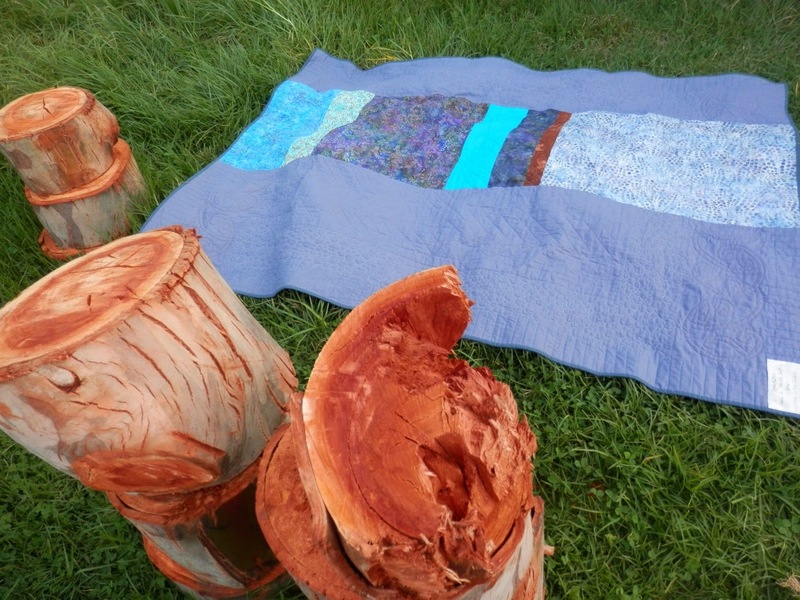 Here's some pictures of a quilt that was a UFO (unfinished object). It's sat around in slowly progressing stages for a couple of years and I'm so glad that it's finally morphed into a useful 'finished object'. 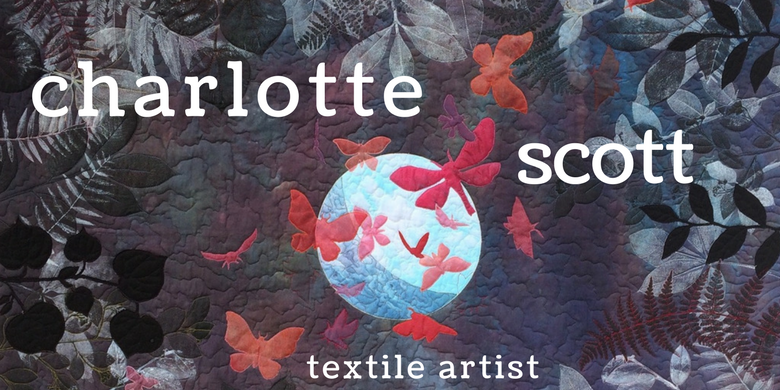 My husband named this quilt Immersion. It has a pretty watery feeling so I think that's appropriate. It is about 60 inches by 80 inches, so drapes nicely on a single bed, covers an ample lap, or decorates the end of a queen size bed. I have to confess that I LOVE the back. 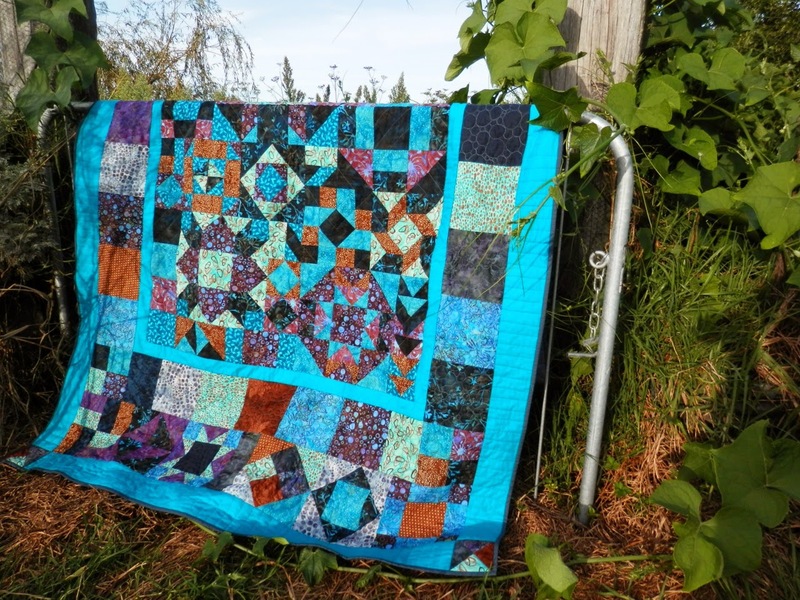 I quilted chevrons in the centre square, pebbles in the next block border, a kowhaiwhai design on the two end borders and then piano keys on the final turquoise border. And I do love me a dark grey binding. I hand finished the binding and stitching it was never a priority so I guess that's why it took so long. But now it's done, and even labelled. Yay! For the purposes of this giveaway, UFO means that you started it before 2014, and finished it this year. If you haven’t yet, check out the group for some pretty awesome entry pics! Now, GO QUILT SOMETHING!! 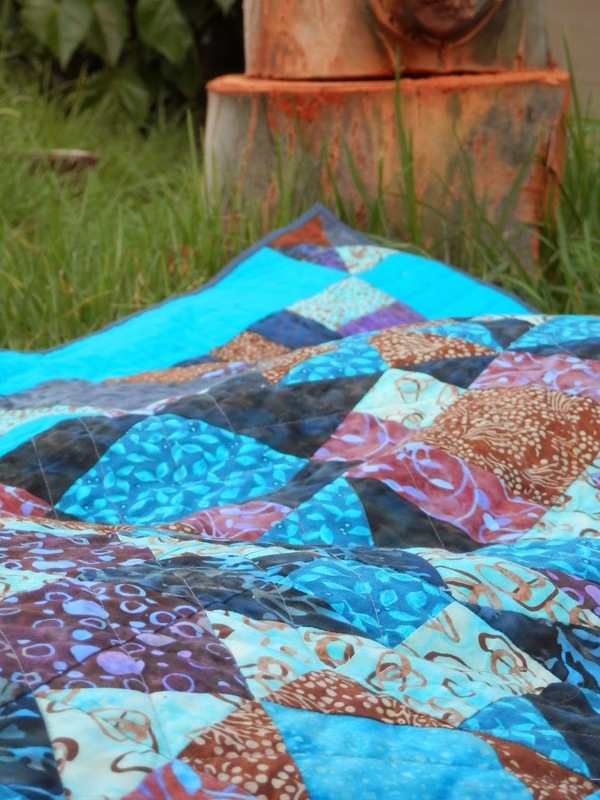 there’s a quilt to be won! I talked about Susan Brubaker Knapp's Facing Tutorial and here's a link to it. It's the best facing tutorial I've found so far. It's a non-mitred one, but she has a mitred tutorial too if that tickles your fancy. 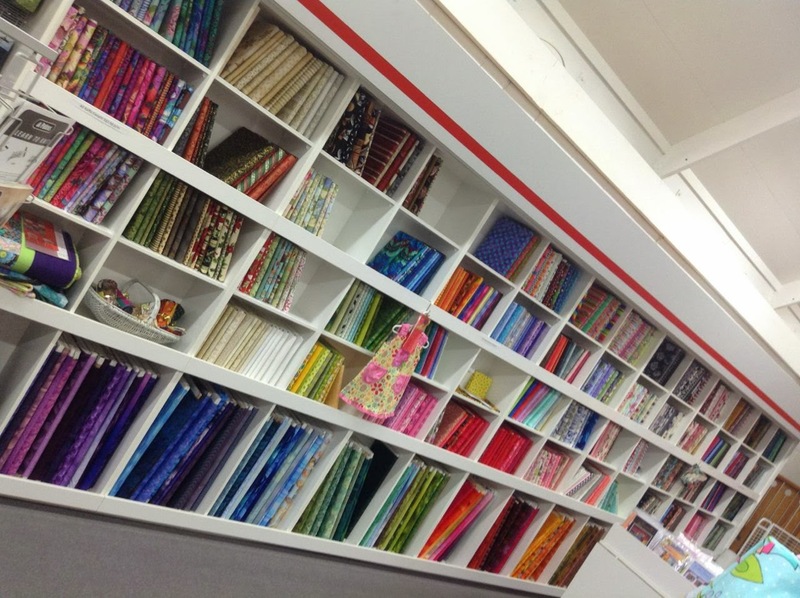 And then, I talk lots about the Whangarei Quilt Exhibition that I visited with my Friday stitching group. But you're going to have to wait for photographs for another day, this post is getting too long! Living Colour! opens soon. I thought I'd publish the exhibition program here so if you are in any of these areas on these dates you can head along and look at some beautiful work. Hint, hint family - I know where you live! Head over to the Living Colour! website for more information. 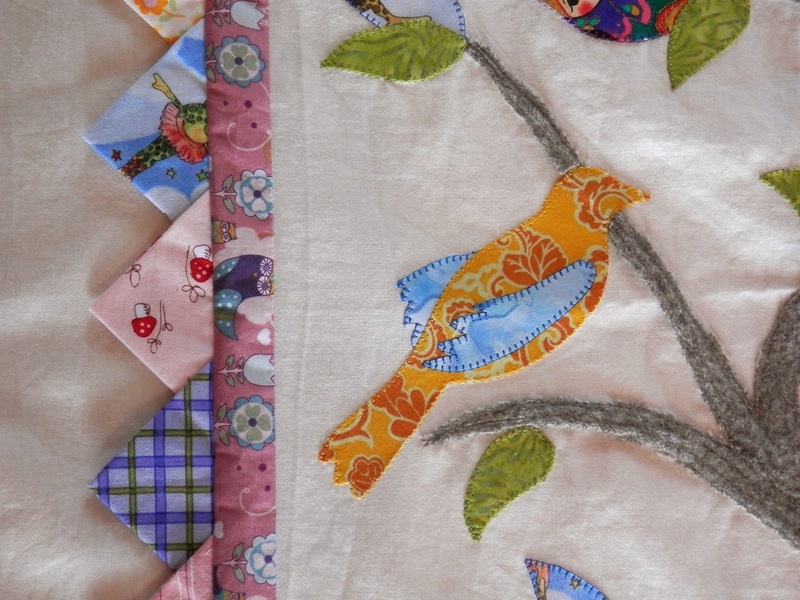 The preview gallery is also getting full with only six more quilts to come. 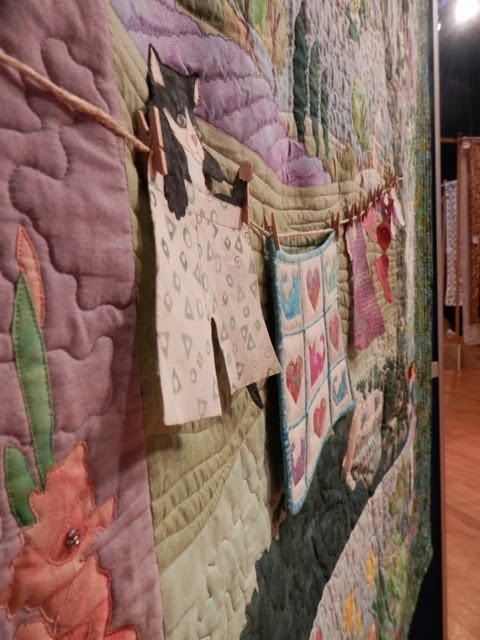 Head there for a glimpse of each quilt. Curator Brenda Gael Smith has put together a wonderful show, the snippets are whetting my appetite for sure! I was working with my students last night at the beginner quiltmaking classes I run (last one - they gave me chocolates to say thank you!! ), when it occurred to me that I never showed the full pictures of the commission quilt I made back in September last year. 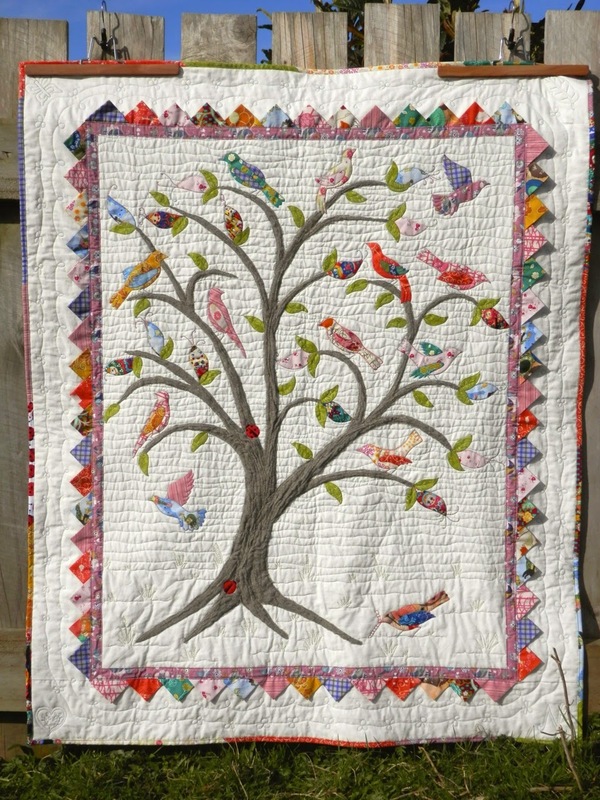 I was using one of the birds as an appliqué pattern for my students and they really liked it so I wanted to show them pictures of the quilt it came from. 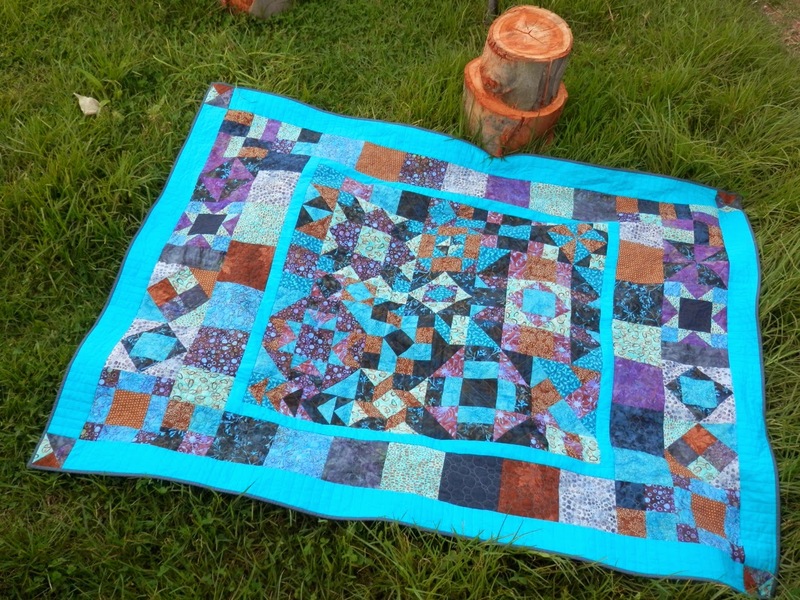 What was tricky about this quilt was all the fabrics. 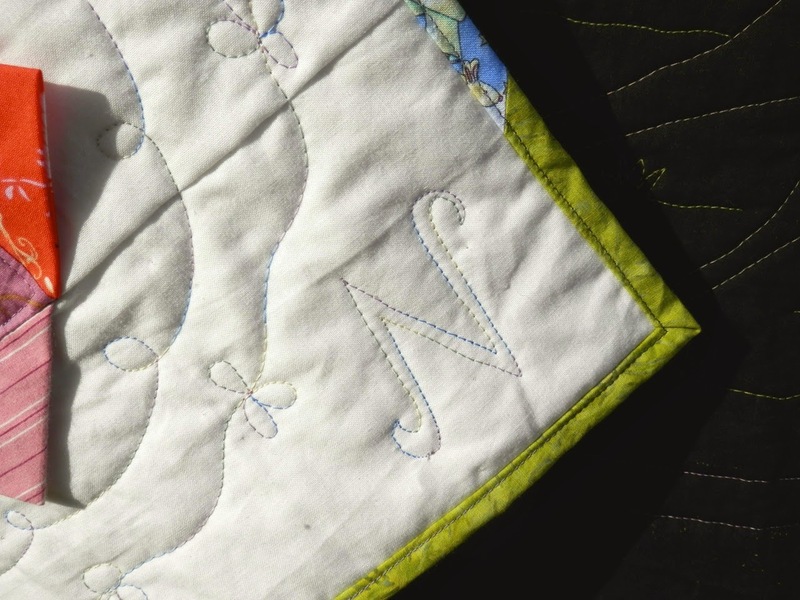 The woman who I was making it for asked her friends to bring pieces of fabrics to the little girl's second birthday party with the intention of putting them into a 'keeping quilt'. 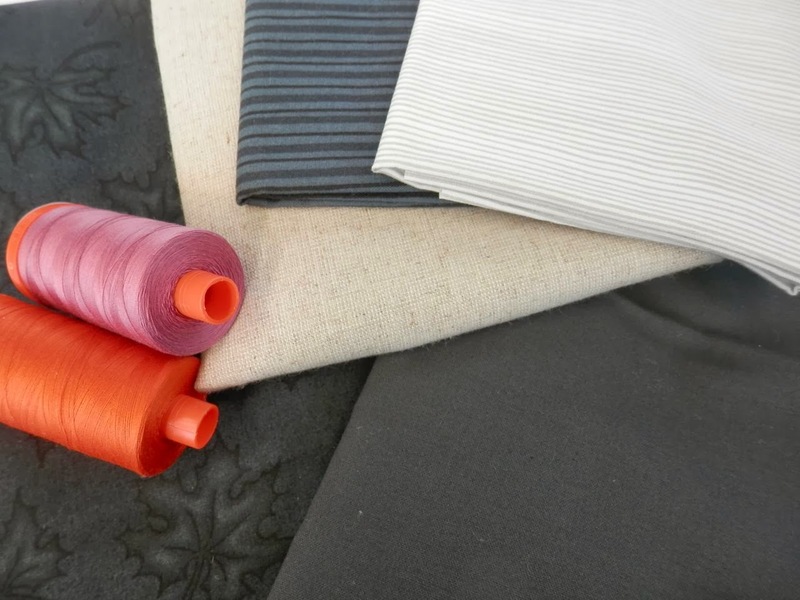 Of course, because they all came from different people, none of the fabrics were particularly coordinating! 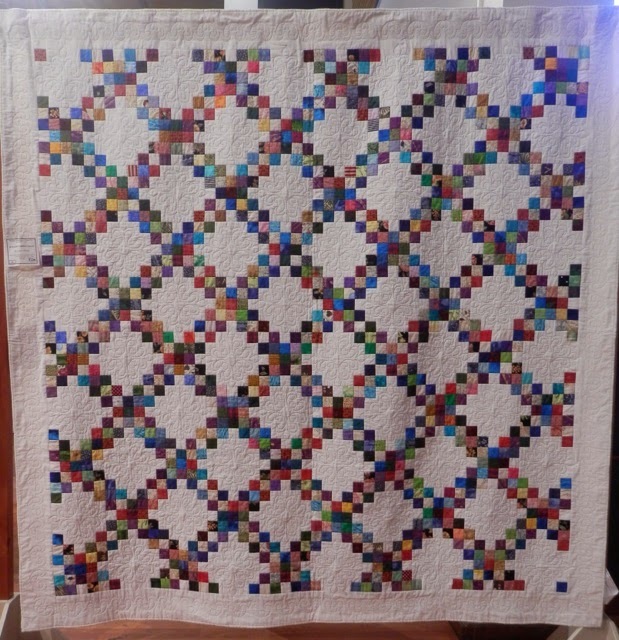 I had a pinterest board to work from, which was a big help in designing the quilt. 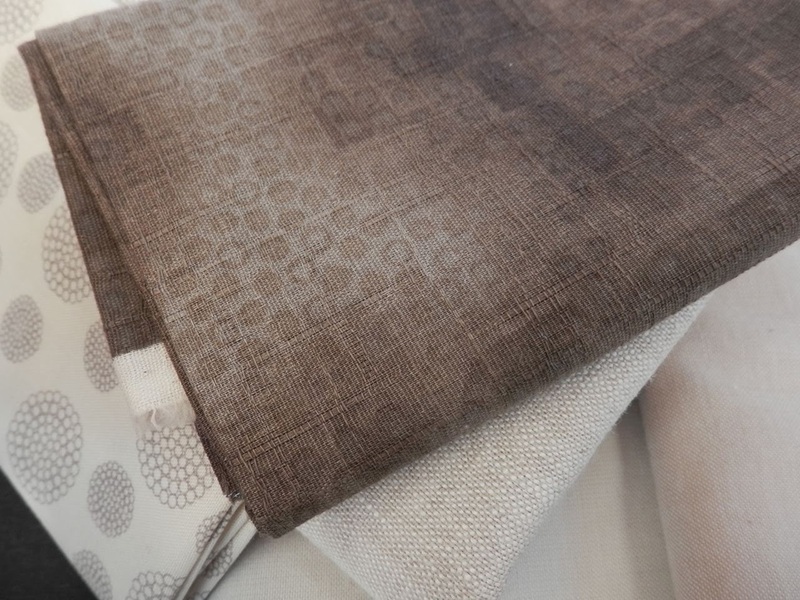 Adding lots of white space made most of the fabrics play nicely with each other. Then I used all the NZ themed fabrics on the back with a black and white strip, black and white being very 'NZ' colours. There was a woollen scarf in the bunch of fabrics and the suggestion was to use this for a tree branch, which I was nervous about but it worked out great. 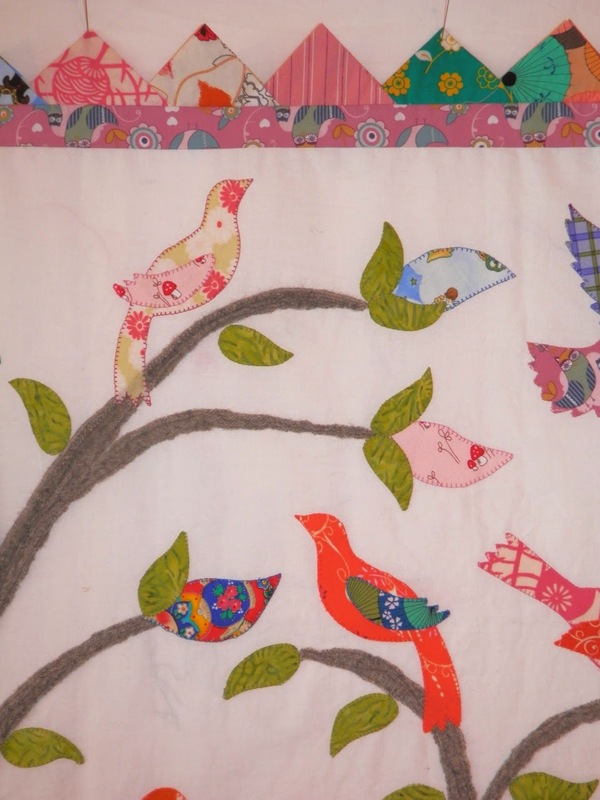 I added more fabrics from my own stash to bridge between some of the original fabrics and I had great fun drawing up different bird shapes. And the one last fabric that I just couldn't make it go with anything else, I made into a bag to put the quilt in. It's the first time I've made prairie points and they were so much fun! 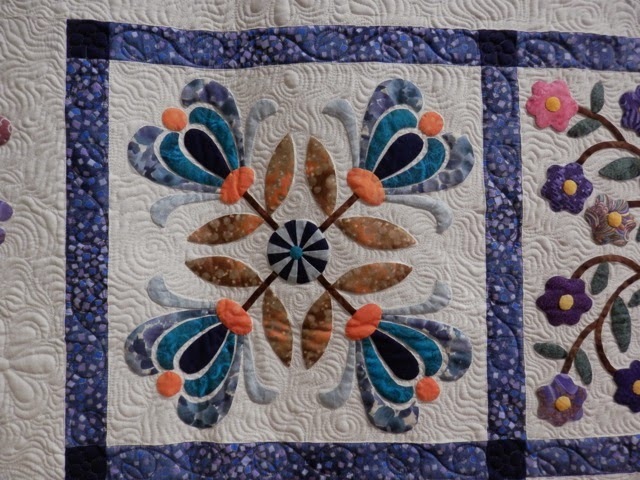 I think they added lots of texture to the quilt and really finished off that central image. 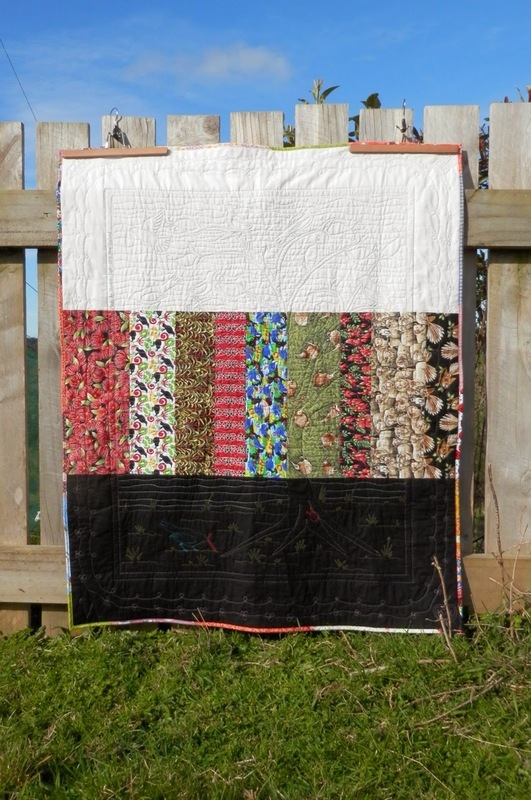 I free-motion quilted it with wavy lines in the sky, grass like lines in the foreground and a line of loops and a line of flowers in the border. I also added the child's initial, a dragonfly, a heart and a leaf into the corners for whimsy. I changed my bobbin thread colours as I went so you would see the 'picture' on the back too. I machine bound the edges, because I was running out of time and I think it's a stronger finish for a child's quilt. And then, to finish it all off, I made a little doll quilt for the girl's dolls. And I still gasp at how cute that is! How about that striped binding?! So there you have it. It was a great challenge and I was incredibly nervous about whether they would like it or not, but I had a wonderful message back about how much she loved it. Yay! I know, no alliteration, but I can never seem to get in step for Work In Progress Wednesday. So, as my Dad would say, you can like it or lump it. 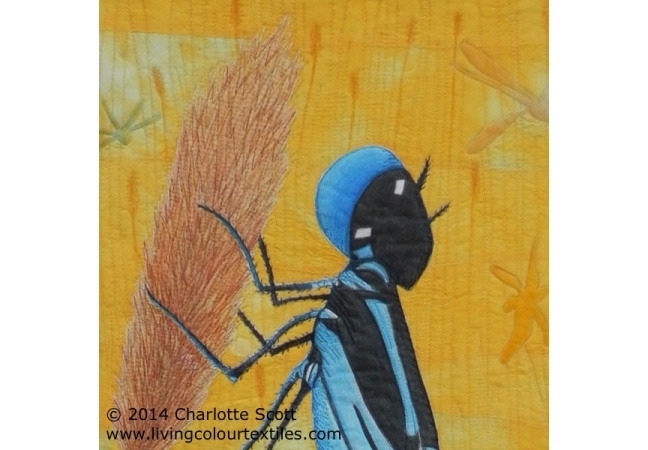 This is my challenge quilt for the Dorothy Collard Challenge. 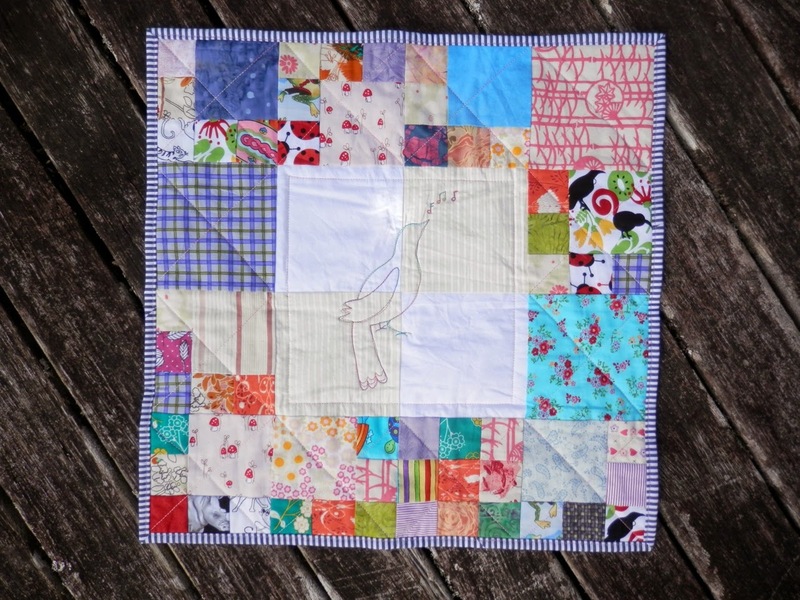 Do you like the swallow quilted in and shaded lightly? Can you see the shading? I have to get a hurry on for this quilt. It needs to be in Auckland for 5th April and I'm going to have to post it due to husbands and hunting trips and other inconveniences. But I'm thinking I'll try and get down for the opening night of the exhibition, that'll be fun. 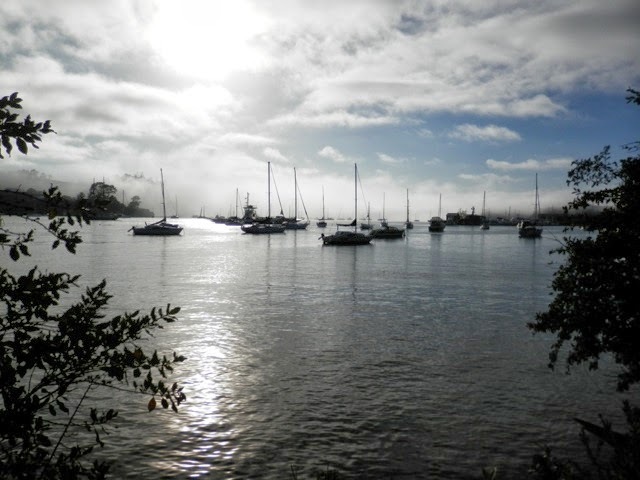 I'm continuing on the spirit of my last post about appreciating where I live. Once a week I attend a yoga class. 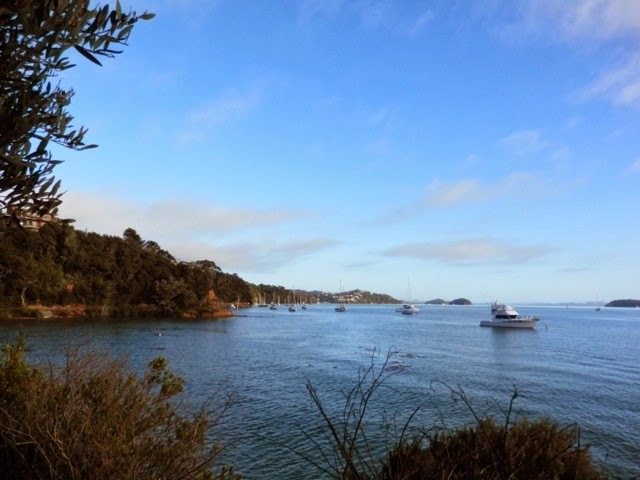 I drop the kids off at school, squeeze in a walk and then stretch and breath through yoga. But it's that walk that I want to talk about. I thought I'd share some photos I took. 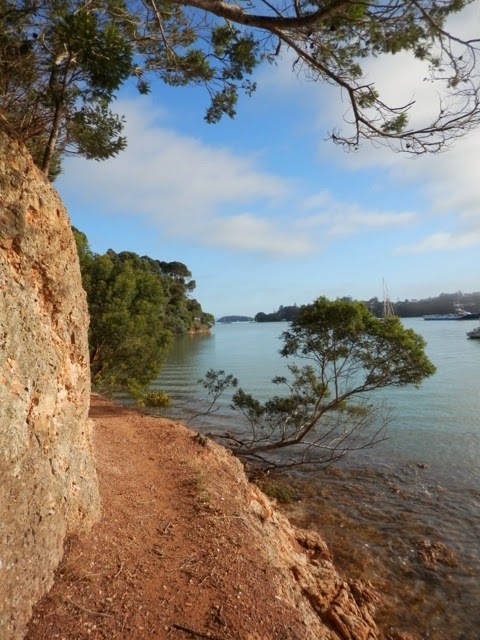 It's along the Opua to Paihia coastal track and it's one of the best local walks there is. 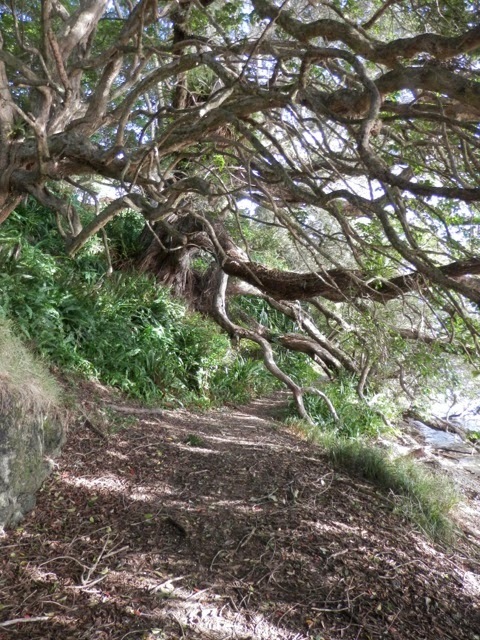 Do you think you walk further and enjoy yourself more when you are walking in a beautiful place? I do. I don't walk here everyday, but only because I don't drop the kids off everyday. Bur rather than waffle on I'll let the photographs tell you how beautiful it is. I live in a beautiful place. Sometimes I forget that and grumble about my dusty car, or my long drive to pick up the kids, or the cow poo on the road. So I'm making a conscious effort to remember how lucky I am. I'm lucky that my closest neighbour is more than 100 metres away. 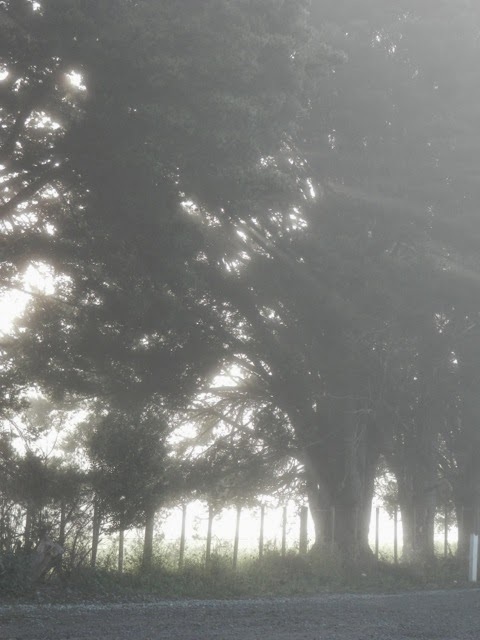 I'm lucky that I see mist instead of smog. I'm thankful that I can smell fresh air, animals and grass. I'm lucky that I can keep chooks and collect my own eggs. I'm lucky that I have no one telling me that my grass is too long/too short/too patchy/too green. 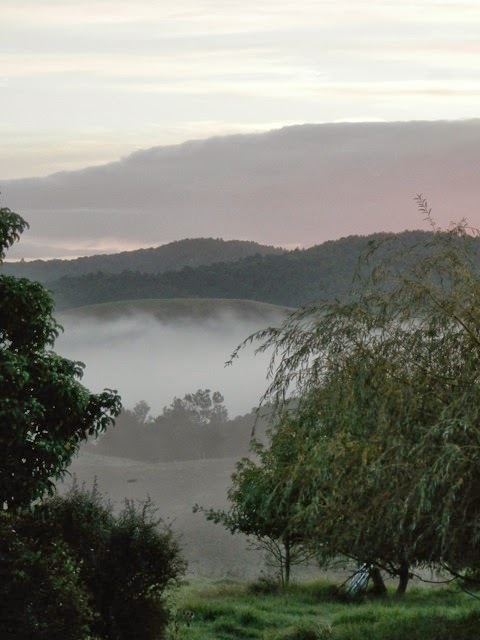 I'm thankful that my view is hills and paddocks and trees. I'm lucky that I have a beautiful place to call home. I'm lucky and I'm thankful. 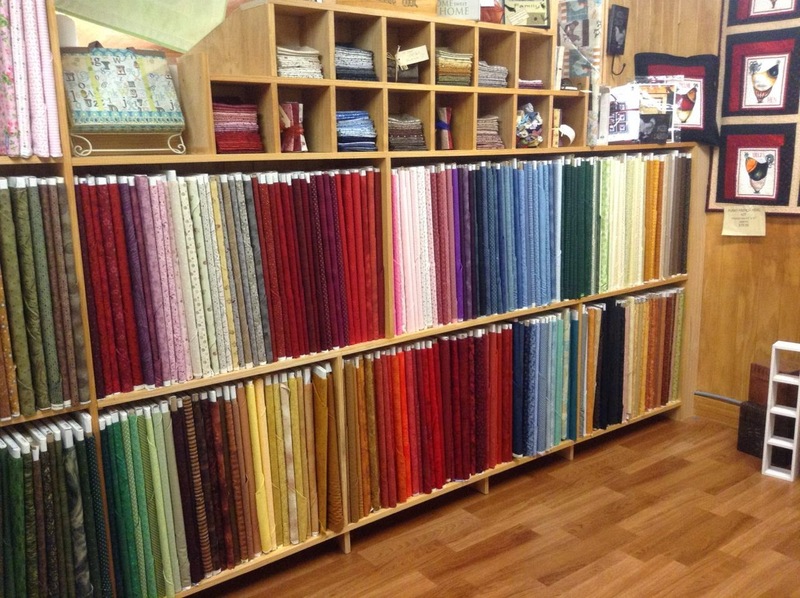 I don't visit quilt shops often, because I don't have any close to me. I have to drive for about an hour to get to one. So when I do visit, I tend to have a list of needs and wants and it always feels like a splurge! 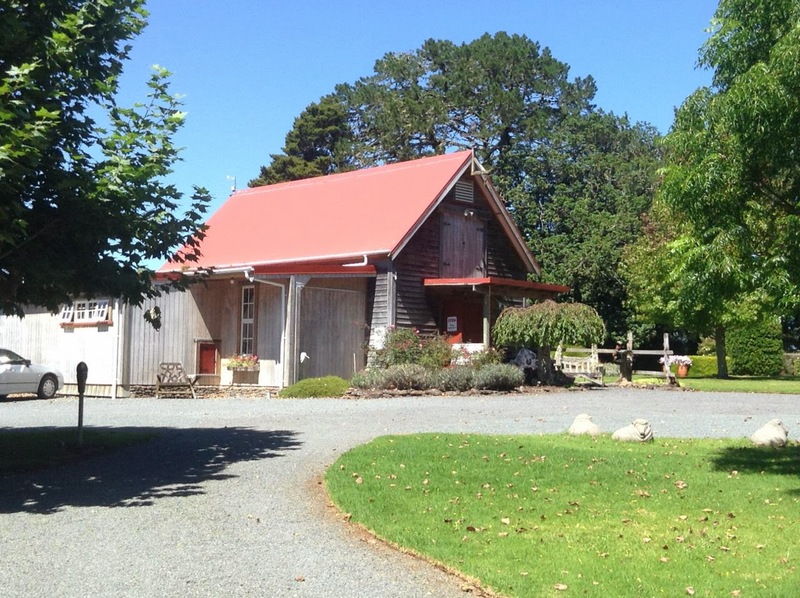 Here are three shops I visited last weekend on my way to Auckland. In my podcast episode 4, I talk more about each one. 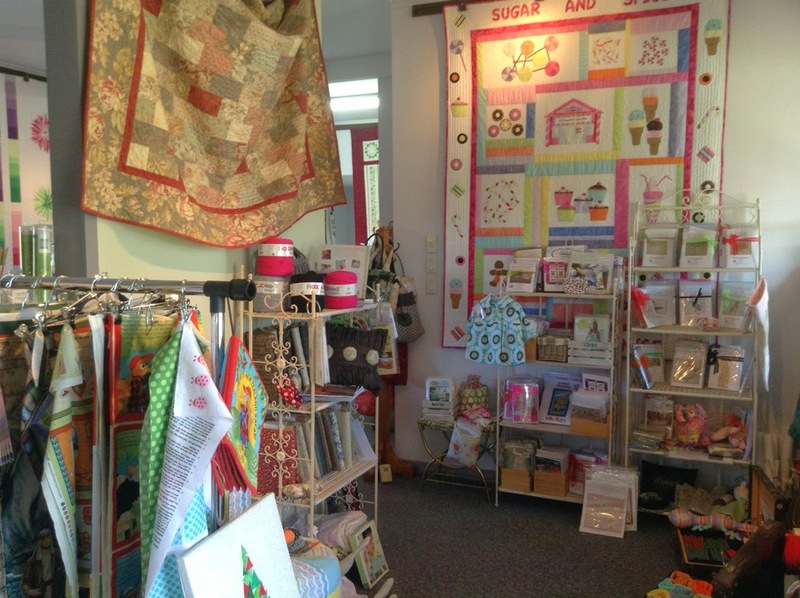 These are photos from The Country Yard, my favourite quilt shop. The staff are just the best and they even have blogs. Click here for Raewyn's and here for Leeanne's. I love their range of Stof basics. These were my purchases, I think I was on a neutrals kick. I also got some crushed walnut shells and a little bit of batting and a new rotary cutter blade - but they don't looks so pretty in a photograph! 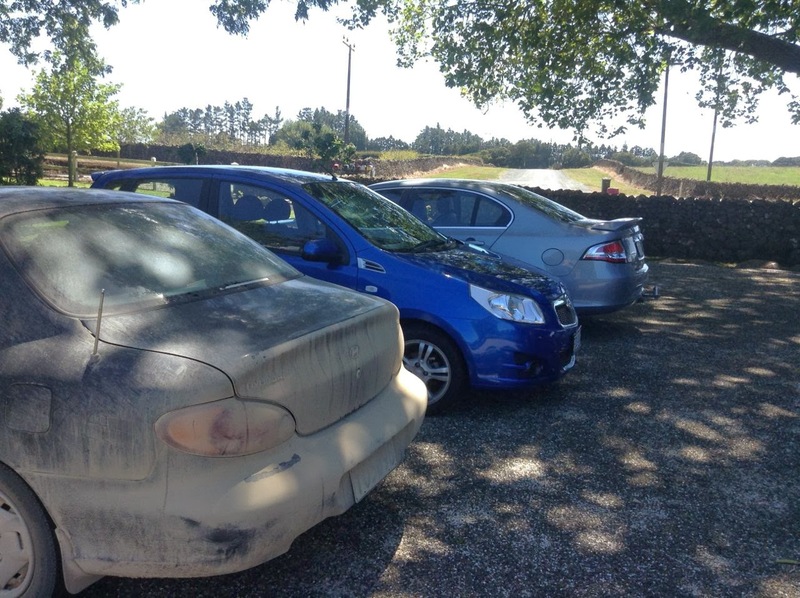 I had to take a photo of my country bumpkin car next to the shiny city ones! 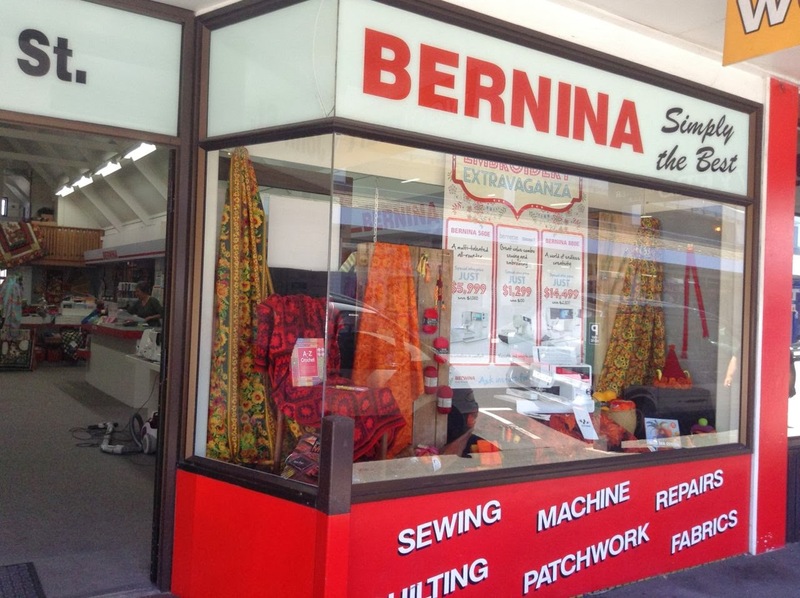 Above are photos from the Northland Sewing Centre. 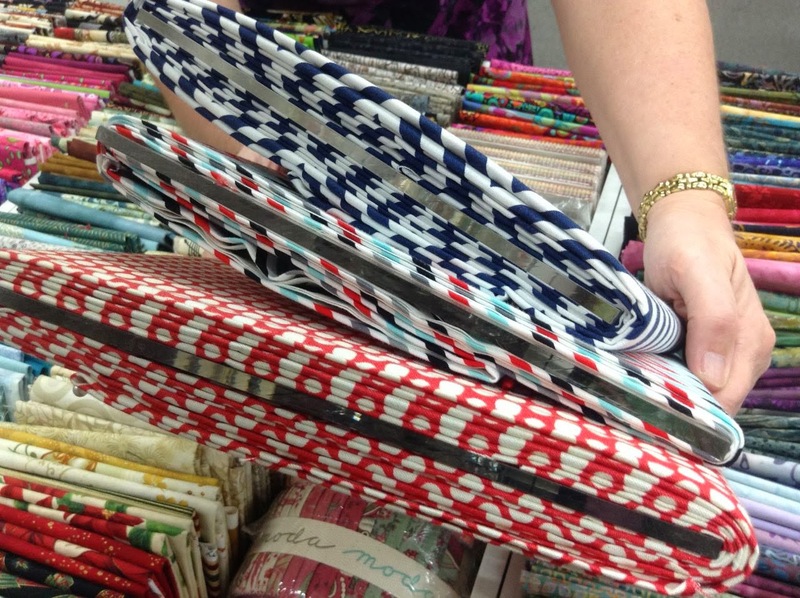 The second photo shows you the fancy acrylic boards that they are wrapping their fabrics on. It makes for a really clean look and much more room on the shelves. 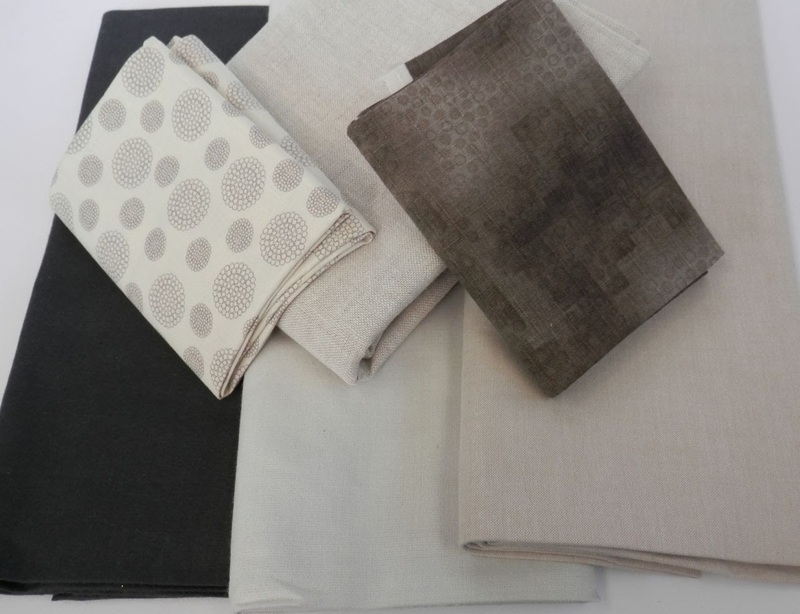 And I bought clean modern looking fabrics to boost my stash. 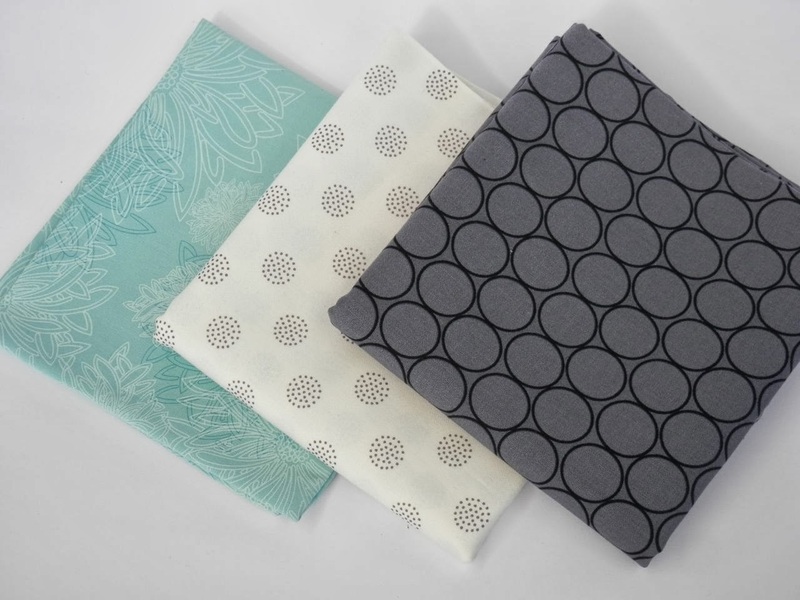 The duck egg one is from Art Gallery Fabrics (I was trying to remember the name on my podcast). 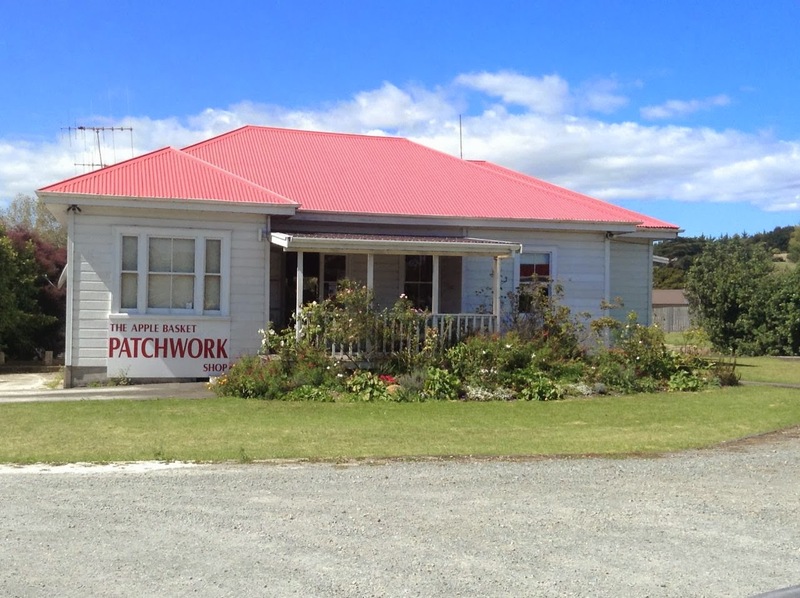 And then The Apple Basket in Kaiwaka. 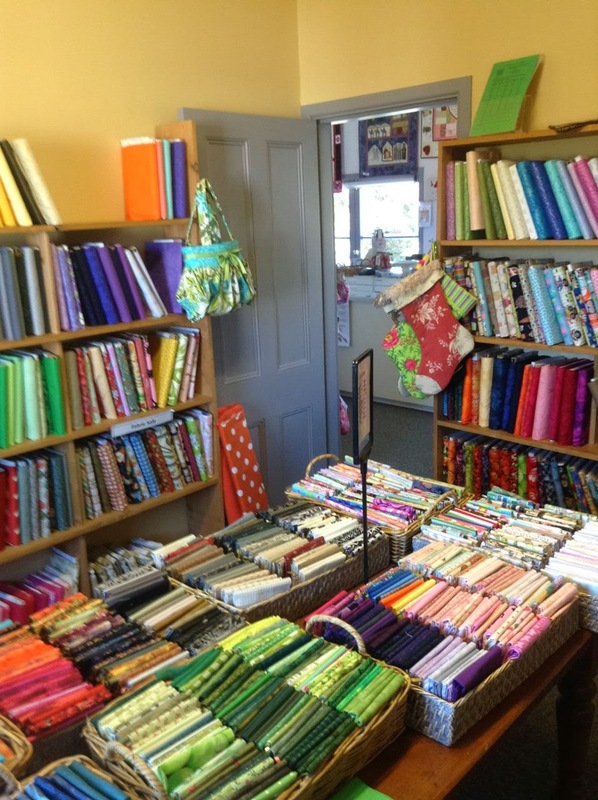 A cute little cottage with a nice choice of fabrics. And here are the purchases I made from The Apple Basket, three subtle shot cottons, a linen, a Sweetwater fat quarter and a Lucien fat quarter. I took a close-up of the Lucien fabric because it had a divine texture. I also talk about what I've been up to, with some project updates, dyeing and running classes. You can listen to Podcast Episode 4 here at Podbean, or wait a little while and it will upload to iTunes. Thanks for listening and I love getting feedback, it's really helpful.